THERE’S no sadder sight than a disused sports stadium – a once vibrant location that was full of people and noise when it was in use. Once the party is over, however, sports venues specifically built for major events are often abandoned. If you believe in ghosts, then these arenas are full of them. 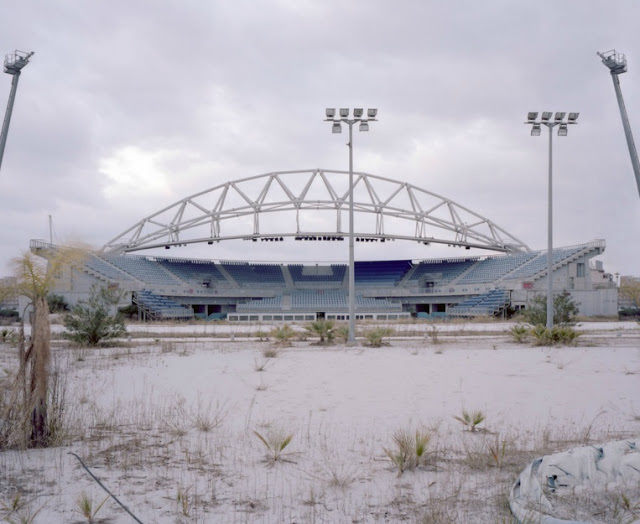 Athens, which hosted the 2004 summer Olympics, is a classic case in point with its decaying legacy, not helped at all by the parlous state of Greece’s economy. And Athens is not alone in neglecting its investment after the crowds have gone home. That’s why Ruben Reddy, an esteemed architect from South Africa, suggested this week at Soccerex that local authorities, governments and planners should start to think “temporary” when it comes to putting on a show. Certainly for major “one-off” events, this is a pragmatic approach, but football rarely adopts a common sense attitude when it comes to money – as we have seen only this week with the removal of Sam Allardyce as England manager. Reddy’s view that cities hosting Olympic Games or Commonwealth Games should focus on temporary buildings that can be removed after the occasion, rather than grandiose permanent structures which incur costs to the city for maintenance and refurbishment. Sometimes, civic pride and the desire to make an impact gets in the way. The World Cup in 2018 will see a number of new stadiums being unveiled by Russia, some in locations that don’t really need such facilities after the competition has moved on. “Some cities just don’t need oversized stadiums,” insisted Reddy. And when the World Cup moves to Qatar in 2022, Reddy is advocating that sustainability is high on the agenda – “reduce, recycle and reuse”, he said. Although Reddy’s concept of temporary event-driven accommodation will work for competitions like the World Cup and Olympics, clubs will always want to build a “home” they can call their own. Football grounds become part of a club’s identity and culture and there was no more iconic place than Athletic Bilbao’s San Mames, which has recently been replaced by a new San Mames. Borja Gonzalez, the club’s stadium director, explained that Bilbao wanted to build a new ground that retained the old stadium’s “cathedral” ambience. It may be spectacularly white on the exterior, but there’s no sign of a pachyderm. Bilbao have created one of modern football’s great new venues. As well as increasing capacity and membership when they opened the new stadium, Bilbao also leveraged the city’s reputation as Spain’s gastronomic capital. Athletic have as many Michelin-starred chefs in their stadium as they have internationally-capped players. It’s an interesting idea that helps cultivate the regional element of the club. Bilbao’s stadium maintained the link between the fans and the club that had been built up over many years at San Mames. Even the approach road to the stadium was unchanged to ensure a seamless transition from the old to the new. Having been to the ground, I can confirm that San Mames is indeed a special place. Great read and in terms of great modern stadiums, I really hope the new Plough Lane stands the test of time and allows Wimbledon to establish roots again.